Lets face it, most people don’t get nearly enough exercise and there is a strong correlation between human and pet obesity. Our dogs rely on us to provide them with the best possible care, but between our own hectic lifestyles and Edmonton’s cold winters, it can be tough to get them out for a daily walk. Besides, the components of physical fitness for both dogs and humans goes far beyond just walking. A well designed fitness program will include elements of muscular strength, core stability, body awareness, endurance and flexibility. Together, these components support our entire body while increasing metabolism and preventing disease & injuries. My unique class is able to address the needs of both species, and even enriches the dogs mind through the mental stimulation of learning new tasks. On top of it all, training together in this way is extremely reinforcing to the bond between human and canine. Do I workout or walk the dog? Now, you don’t have to choose! My dog Josie and I LOVE coming to Mutts & Butts classes with Sarah! 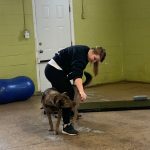 The classes are always challenging, with tons of modifications and options that make them accessible to people (and dogs) of all fitness levels. The classes are a fun and awesome way to bond with your dog as well as get outside and make the best of our relatively short summers. I have also done an indoors class at the humane society which was equally as awesome! Since coming to classes I feel like Josie and I are closer than ever. Josie is also always SO tired after class, and she’s a quite high energy dog so it’s nice to have her fast asleep when we get home haha. She truly gets a great workout- body and mind. I’m also always tired and sore after class (in a good way!!). Both human and dog are sure to get a great workout! Sarah truly goes above and beyond to make sure it’s an awesome experience for everyone in every class she runs. I can’t say enough great things about Sit Stay Squat!!! Try a class, you will love it! My dog Josie and I LOVE coming to Mutts & Butts classes with Sarah! 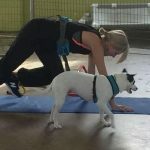 The classes are always challenging, with tons of modifications and options that make them accessible to people (and dogs) of all fitness levels. The classes are a fun and awesome way to bond with your dog as well as get outside and make the best of our relatively short summers. I have also done an indoors class at the humane society which was equally as awesome! Since coming to classes I feel like Josie and I are closer than ever. Josie is also always SO tired after class, and she’s a quite high energy dog so it’s nice to have her fast asleep when we get home haha. She truly gets a great workout- body and mind. I’m also always tired and sore after class (in a good way!!). Both human and dog are sure to get a great workout! Sarah truly goes above and beyond to make sure it’s an awesome experience for everyone in every class she runs. I can’t say enough great things about Sit Stay Squat!!! Try a class, you will love it! Sarah is amazing. She works so hard and cares so much for humans and dogs alike! 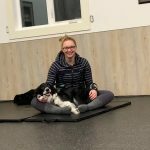 We took a class with her earlier this year and it was an amazing bonding experience for my dog and I. Sarah helped challenge us and gave us guidance, while keeping it fun! Just recently, she took my stress away when she walked our dog for us, for an hour, twice in one day! She sent me pictures and updates and I know that Milli was in great hands. Thank you so much Sarah!! Sarah is the absolute best!! Our two dogs, Maddie and Max adore her visits. 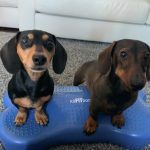 Sarah works with both of them to strengthen their core to prevent back injuries as they are Dachshunds and susceptible to back problems and paralysis. She brings exercise equipment to our house to do little training sessions with them. She always sends us updates on how they did, along with photos. She genuinely loves dogs and it shows as our dogs love her to death!! She is also very reliable and punctual, I don't know what we would do without her!! I feel at ease when I am away from my dogs during work hours as I know they will be in the best capable hands. Thank you for everything you do, Sarah!! If you need someone to stop in for a mid day dog visit, Sarah is your girl, she is amazing!!! I look forward to trying one of her Sit Stay Squat work out classes one day too!! Wicket loves going to Doga! Sarah has become one of his favorite people over night! 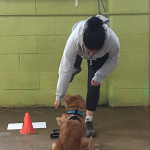 She is amazing with all the dogs in the class and very friendly and a wonderful instructor! Wicket and I give Sit Stay Squat 5 paws up! 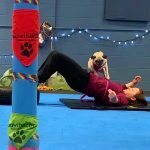 I've always kept active with my 8 year old pug so when I saw a bootcamp style workout class that you do with your dog, I knew we had to sign up! The weekly classes have been such a great experience not only physical fitness-wise but I have also noticed an increase in my pug's confidence and energy. She is standing on wobble boards and Bosu balls, jumping over and crawling under different height bars, and using muscles that she doesn't really get to use on her day to day hikes and walks. She had fear issues before with slippery or different textured surfaces and now she is jumping up on plastic steps and going down slides! 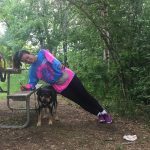 Sarah is knowledgable in both human and canine fitness and has great ideas to incorporate meaningful exercises for the dogs alongside their humans (who are also getting a good sweat on!) The classes are small so there is lots of personalized attention and the dogs love Sarah to bits. I just signed us up for our tenth round of classes as I don't think my pug would forgive me if we stopped going. I've always kept active with my 8 year old pug so when I saw a bootcamp style workout class that you do with your dog, I knew we had to sign up! The weekly classes have been such a great experience not only physical fitness-wise but I have also noticed an increase in my pug's confidence and energy. She is standing on wobble boards and Bosu balls, jumping over and crawling under different height bars, and using muscles that she doesn't really get to use on her day to day hikes and walks. She had fear issues before with slippery or different textured surfaces and now she is jumping up on plastic steps and going down slides! 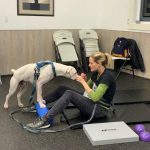 Sarah is knowledgable in both human and canine fitness and has great ideas to incorporate meaningful exercises for the dogs alongside their humans (who are also getting a good sweat on!) The classes are small so there is lots of personalized attention and the dogs love Sarah to bits. I just signed us up for our tenth round of classes as I don't think my pug would forgive me if we stopped going. Taking classes with Sarah is an absolute pleasure! 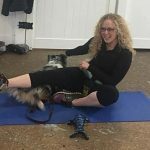 She has a warm heart and her passion for dogs and fitness shine in each class. 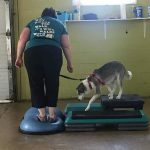 Classes are highly recommended; they are such a fun way to get a workout in and have your pup along for the ride. Hurley and I love your Sit, stay, squat classes. I registered initially as a way to force me out of the house to a class which I knew Hurley would enjoy. Well wouldn't you know it I enjoy getting out and socializing with like minded individuals who love to bring their dogs to exercise class. Usually by week two or three of exercise classes I find myself looking for excuses to avoid going next week. This is not the case with Sit, Stay, Squat. I have actually already registered for the next two rounds! I think your class is the perfect mix of hard work for the humans and dogs with the rewards of laughter and accomplishments. Just look at Hurley rocking the balls. Week one he wouldn't even touch them! I look forward to continuing to work with you in the coming weeks. Sarah with Sit Stay Squat is amazing!! I was looking for a fun way to make some lifestyle changes and was thrilled to find her classes! 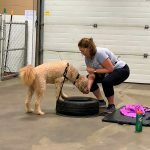 My busy puppy (Jelly) and I loved our Sunday boot camp so much that we signed up for the Wednesday class too! Sarah is a great instructor and focuses on each person in the class. I’ve never had so much fun getting fit! Sarah with Sit Stay Squat is amazing!! I was looking for a fun way to make some lifestyle changes and was thrilled to find her classes! 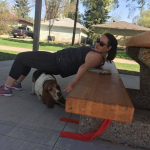 My busy puppy (Jelly) and I loved our Sunday boot camp so much that we signed up for the Wednesday class too! Sarah is a great instructor and focuses on each person in the class. I’ve never had so much fun getting fit! 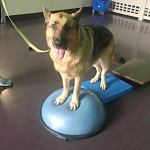 Had a blast this past month at Sarah's indoor classes at the humane society with my GSD Rusty. After 10 minutes of each class he usually would catch on and he seemed to really enjoy doing the different stations! And a bonus was he was always pooped when we got home! Great for the mind, our bond and using muscles that he wasn't used to using. Thanks Sarah! Rusty and I cant wait to join you for some outdoor classes! My dog loves this class!!! Sarah is amazing and not only does my dog have fun, I do too. All while still getting to work out! Can’t say enough about these classes.